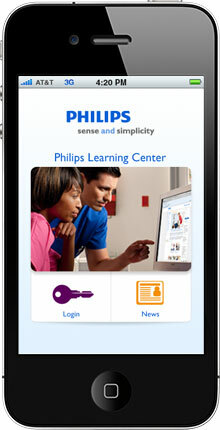 Track your Philips Learning Center continuing education units (CEU's) and nursing contact hours with our easy to use Continuing Healthcare Education Tracker app for iPhone or Android. This free CE tracker app is available to all healthcare professionals who are registered users of the Philips Learning Center. You will be able to track your learning activities and get the latest news and discount course promotions delivered right to your mobile phone, anytime, anywhere! For license renewals or professional development, this app is the simplest way to track your CEU’s. Quickly view reports of your completed CME (non-physician CMEs only) and CE by any date range of your choosing. Then, drill down to see the details for each course. You can also get a report for your uncomplete learning activities with course expiration dates. Not a member of the Philips Learning Center? Registration is simple, easy, and free! Click on “Register today” and follow the online instructions to create your personal account. Be sure to indicate your specific profession so we can regularly update you on new, relevant courses and discount programs. ©2004-2011 Koninklijke Philips Electronics N.V. All rights reserved.